My friend and running buddy Jacob 'Jake' Dinardi (http://HikeItLikeIt.com/) and I were talking the other day and thought it would be rad to do some sort of collaborative post since both of us are blogging nuts. We put our heads together and came up with the idea to talk about some hydration vests. BOOM! I'm going to talk about the Orange Mud HydraQuiver Single Barrel and the Ultimate Direction Anton Krupicka (“AK”) Race Vest; whereas, Jake will be covering the Ultimate Direction Peter Bakwin (“PB”) Adventure Vest, and the Nathan HPL 020 Hydration Vest. There are a lot of hydra-vests on the market of course, but this small group covers the bases pretty well from the most minimal all the way up to something an adventure racer would reach for. In this installment we'll review Orange Mud's Single Barrel Quiver. Check it out and let us know what your favorite vest is! Orange Mud Single Barrel: A minimalist vest that offers an alternative to carrying a handheld. Like many of us Josh Sprague, founder of Orange Mud and developer of the Quiver, was frustrated with many of the existing hydration packs of the day (fanny packs, hand-helds, back packs) and decided to build the ideal means of carrying water and supplies that minimized the negatives. What was born was a Quiver, something completely unlike anything else on the market and sure to turn peoples head at the next training run or race! The single barreled Quiver is Orange Mud’s first hydration pack and signature product. Just like an arrow quiver, the bottle holder sits high on your back ready for the bottle to be quickly pulled to quench your thirst. Putting the bottle on your back does two things : it obviously frees your hands but also uses your powerful shoulder muscles to support the weight. The single 23 oz water bottle fits nicely for a routine 10 mile run or half marathon through ultra trail run (aid stations every ~6 miles). The foam padded mesh harness is so comfortable you can wear it shirtless (even better with optional Padded Sleeves to remove any possible strap chaffing). Having run many long runs using just a hand-held I was eager to try something that would free my hands but not weigh me down like a traditional hiking backpack. The first time I saw an Orange Mud quiver on the trails I just stopped in my tracks to gawk at the runner. [Latter to be named the Quiver Gawk] I knew I HAD to have one and bought one that same week. 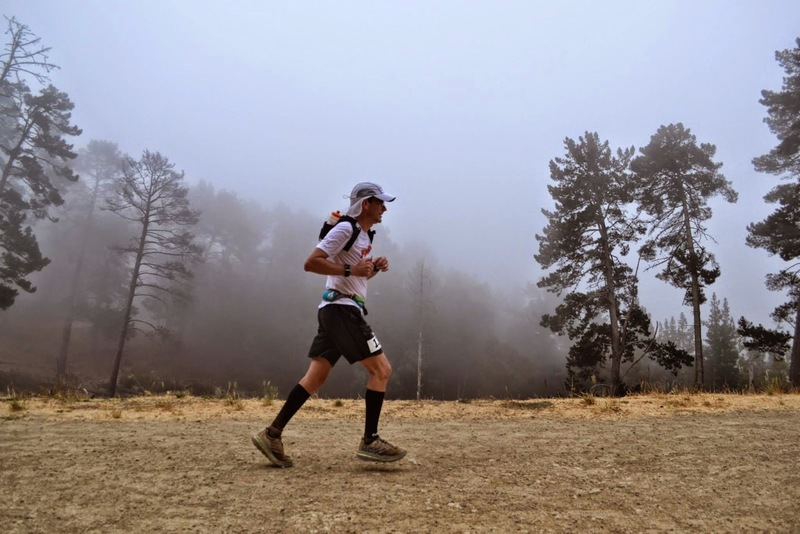 The first race I used it on was the last 25 miles of American River 50 in Sacramento, then on the San Francisco Marathon, Skyline 50k, Overlook 50k and worked perfectly. The HydraQuiver comes in a single unisex size with two very simple side adjustment straps. The straps do dangle and may lead to chaffing if used shirtless but both are solved buy buying the optional padded sleeves (highly recommended and comes supplied with dual quiver). Once strapped down there is no harness bounce and little bottle sloshing. The bottle should rid high on your back but not so high that if you lean your head back you make contact with the bottle top. Once you get it adjusted it will stay and you’ll forget you’re wearing it. The foam padding allows for one of the best fitting packs I've ever warn and since it breaths via the mesh surface and air channels you shoulders and back won't get too sweaty. It will take a few steps to learn how to reach your arm back to pluck the bottle from quiver and return it but is rather easy to learn to do. There is no cross adjustment in the front between straps as you would expect in a backpack but don’t think I ever thought I needed one. There are two easy to reach shoulder pockets that Orange Mud states you can pick 8 GU gel packs per but I was only ever able to get two per. I wish there were pockets on the sleeves. The rear cargo area is well in the rear so pretty much useless whilst running. Also if you cram a bunch of stuff into the storage area expect to readjust the straps due to bulk and weight. However, it is such a luxury to have so much optional storage space to store emergency supplies (medicines, extra food, etc). The Quiver is made in the USA. I used it for training and racing for a full year and the quiver pretty much looks the same with no wear spots, no tears, no stitching coming undone. Very well made. I own the ‘black’ colored version so I can’t comment on how lighter colors hold up after being exposed to trail dirt or repeated hand washings. My black quiver is still black. The quiver is a minimalist hydration backpack! There is no skimping on comfort, but there are only two shoulder spandex pockets to hold small items like GU packets. There is a large 54 cu in zippered storage pouch in back that is excellent to store emergency items. There are also 'tie down' holes on the bottom where in theory you could use the optional cord set to possibly strap down another bottle, jacket or other items. I have not tried this and would be concerned about bounce and the extra weight ruining the very comfortable fit. I’d like to see two additional pockets on the padded sleeves or on the straps that could hold GU or salt capsules, etc. If you are tired of sore wrists after long runs and don’t want to wear a full hydration backpack then the Quiver is for you. The shoulder harness is so comfortable you can wear it shirtless and the two front pockets offer enough space to hold a few gels. The 23 oz water bottle is enough to get you from one Aid Station (AS) to the next ~six miles away on your typical supported trail run – depending on heat and your own personal hydration needs.